I just applied leave from work for 07 May 2011 and given that I for one do not really take leave at all, except for home leave (which I only took 3 of out the 4 entitled last year), came to my boss as a surprise. Boss: You take leave? Seriously? JayWalk: Yes. I want to travel to Hong Kong to cast my vote on that day. Boss: Aiyah. 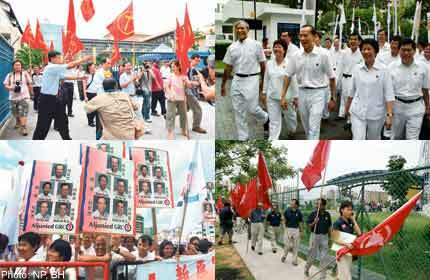 Lee Kuan Yew will remain in power one, You vote also no use. JayWalk: Regardless, I still want to make my vote count. If we can pull them down by one solitary vote, let that vote be mine. I was given a nod of approval and a smile as if he discovered a new admiration for me. So by now, you would have guessed that I should be casting my vote in favour of the opposition. One motorbiking badass turbanator Singh with the talented gift of the gap should be my man to lead his team to run my constituency for the next 5 years or more. Here's the thing. You notice I used the word "should" instead of "would". I am 90% inclined to vote for the opposition but given I still have time to mull things over, why the need to make a committment so soon? I am keeping a 10% reservation to see what unfolds further that may swing my vote over to the PAP or simple nail the PAP coffin shut. During the last election, a Marine Parade GRC friend spoke to me about how he was pressured by both parties to vote for them respective. He was in a bind as on one hand, he was not happy with the incumbent PAP while on the other hand, he did not feel that the candidates offered by the opposition were good enough. So in the end, he marked Xs on both parties to spoil his vote. The brilliant part was that when he came out of the voting booth, he was able to look them straight in their eyes and said that he voted for them. It was a funny anecdote back then but I would advise against doing it this time. Do not spoil your vote. Make every vote count. The country needs to hear your voice out loud. Hey dear, share your overseas voting experience come 7 May. I'll see what I can do since I doubt if overseas voting is any different from local voting. Also the fact that cameras are banned and so that makes blogging an entry about voting a tiny bit more difficult.